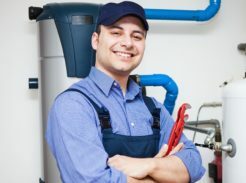 Peter Stannard Plumbing, Gas & Air-Conditioning offers reliable and professional gas services to homes and businesses throughout Perth’s suburbs – Rockingham to Joondalup and all surrounding areas. We specialise in the diagnosis and repair of gas leaks and the installation of gas appliances. Our experienced gas fitters use the latest diagnostic equipment to detect gas leaks, including those caused by burst pipes underground and above-ground gas fittings. Our gas fitters are fully qualified and licensed to carry out gas appliance installations, including gas hot water systems, gas ovens, stoves, cook tops, mains pressure gas storage water heaters, continuous flow hot water systems, gas heaters, and more. For further information about our gas services, email peterstannardplumbingandgas@live.com.au or phone 0402 731 795. Pensioner discounts available. Copyright © 2019 Peter Stannard.